Captrate© Filters use the latest technology in multi-stage grease filtration, delivering unparalleled efficiency for restaurant hood systems. 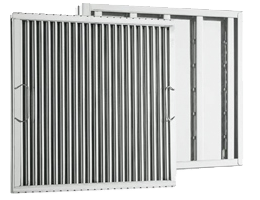 The Pollution Control Unit, VPCU Series, is a mechanical filter arrangement for the removal of smoke and grease particulate from the exhaust air stream of kitchen exhaust system. The ETL listed Energy Management System is designed to automatically reduce exhaust and supply airflow quantities while still completely capturing & containing heat and smoke generated by the cooking appliances. Electrical Control Panels are available in single phase, three phase and mixed voltage configurations. The panels are pre-wired at the factory based to meet specific applications and include color-coded wiring. Designed to control the exhaust fans, supply fans and lights for the kitchen ventilation system.